Most of us had a forum to exchange ideas. But most had not fully promote Adsense ads. Google had suggested a few ways to increase the clickthrough rate effectively. When Amit Kumar co-founded MegaGames Forum in 1998, Google Inc. was being run from a Menlo Park garage and AdSense didn't even exist yet. Fast-forward 9 years to 2007: Amit still runs MegaGames Forum just as a hobby, but he earns enough revenue through the AdSense program to run a dedicated server and continue growing his site. 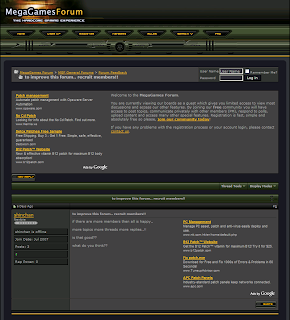 Many forums have a message above the fold on their pages welcoming users to the site and encouraging them to register. Placing a large (336x280) or medium (300x250) rectangle next to this message catches users' attention right when they walk through the door (so to speak). By the way, these are our best performing ad units, and may also increase the number of site-targeted ads on your pages. Colors are important for making an ad visible to the user, but they should still blend with the design of the site. Removing the borders on your ads helps even more with this concept of blending. Don't worry -- even with a well-blended implementation, the 'Ads by Google' label keeps your users from confusing ads with content. are you running your own forum? how do get all this experience? how much i can trust u?